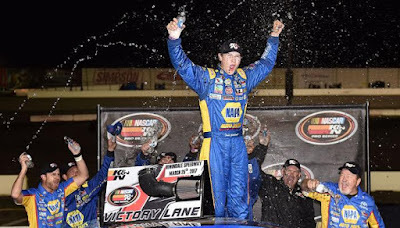 The Twin NAPA 100s marked the final two of four races in eight days that comprised the ‘NAPA 500 Challenge.’ It was all Todd Gilliland this weekend. If you have not heard of this newest Gilliland, you are missing out on some great NASCAR Racing – the K&N Pro Series. The 2017 season has been tremendous for the Sherrills Ford, North Carolina native. Todd is the son of NASCAR Driver David Gilliland who won eleven races at Irwindale Speedway and grandson to former NASCAR Winston Cup Series and Craftsman Truck Series driver from California Butch Gilliland. Todd recorded a second-place finish in the K&N Pro Series West season opener at the Tucson Speedway. He then progressed to win the ‘NAPA Auto Parts 150’ at the Kern County Raceway Park, and the NAPA Auto Parts Twin 100 and ‘NAPA Auto Parts T-100’ at the Irwindale Speedway. Amazingly all three wins came from pole. BMR Teammate Chris Eggleston won the season opener. He was able to mount a fierce challenge late in the second race with his No. 99 NAPA Filters / H20 Fire Protection Toyota Camry, but Gilliland battled back to lead all 100 laps of that event. “The last couple of laps I gave it all I could,” Eggleston said. “I came up little short.” Eggleston had tried to dive low, but could not keep ground. “That’s what you have to do if you’re on the bottom here,” Gilliland said of the move by his teammate. “That’s how you get the lead. He did that and luckily I was able to cross him over there and get back to the lead, and then he did it again. It was fun. That’s the kind of great racing this track produces. With top-three finishes in all four races of the NAPA 500 Challenge, 2016 Series Champion Gilliland netted a $10,000 bonus. Eggleston – the 2015 series champion from Erie, Colorado – was one of two drivers who each won a $5,000 bonus for finishing in the top five in all four races. 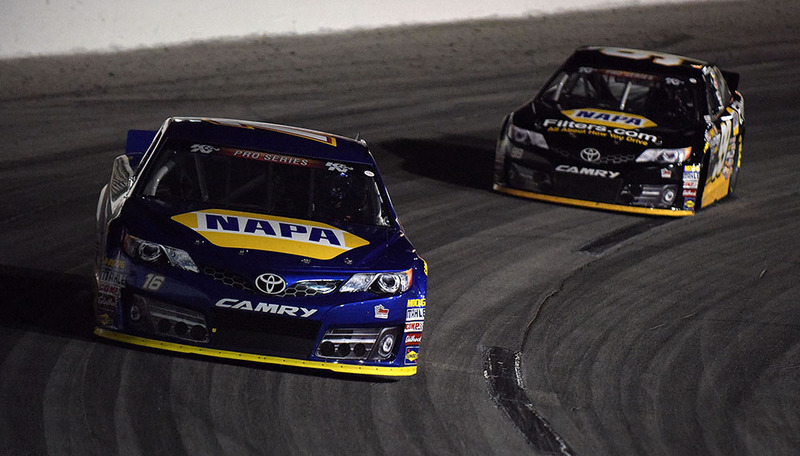 The twin NAPA 100s will be televised on NBCSN on April 1 at 4 p.m. PT. 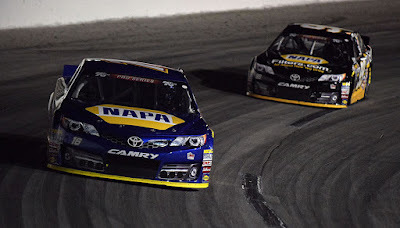 The next event on the K&N Pro Series West schedule will be the NAPA 150 at Spokane County Raceway in Washington on May 13. (1) Todd Gilliland, Sherrills Ford, N.C., Toyota, 100 laps. (2) Chris Eggleston, Erie, Colo., Toyota, 100. (5) Garret Archer, Maple Valley, Wash, Ford, 100. (21) Nicole Behar, Spokane, WA, Toyota, 100. (8) Will Rodgers, Solvang, Calif., Ford, 100. (3) Michael Self, Park City, UT, Ford, 100. (11) Blaine Perkins, Bakersfield, Calif., Chevrolet, 100. (10) Johnny Borneman, Ramona, CA, Ford, 100. (7) Matt Levin, Tucson, Ariz., Chevrolet, 100. (4) Julia Landauer, New York, N.Y., Ford, 100. (12) Todd Souza, Watsonville, Calif., Toyota, 99. (9) Ron Norman, Tucson, Ariz., Chevrolet, 99. (14) Bill Kann, Scottsdale, Ariz., Toyota, 99. (19) Kody Vanderwal, LaSalle, Colo, Ford, 98. (15) Rich DeLong III, Santa Clarita, Calif., Chevrolet, 98. (16) Takuma Koga, Nagoya, Japan, Chevrolet, 97. (17) Dan Phillippi, Los Angeles, Calif., Ford, 94. (6) Derek Kraus, Stratford, Wis., Toyota, 91. (18) Stafford Smith, Eagle, Idaho., Ford, 58, accident. (13) Dan O’Donnell, Oak Hills, Calif., Ford, 57, accident. (20) Jesse Iwuji, Carrolton, Texas, Chevrolet, 25, engine. (7) Michael Self, Park City, UT, Ford, 100. (6) Derek Kraus, Stratford, Wis., Toyota, 100. (10) Will Rodgers, Solvang, Calif., Ford, 100. (13) Nicole Behar, Spokane, WA, Toyota, 100. (12) Blaine Perkins, Bakersfield, Calif., Chevrolet, 100. (11) Todd Souza, Watsonville, Calif., Toyota, 100. (3) Matt Levin, Tucson, Ariz., Chevrolet, 99. (8) Johnny Borneman, Ramona, CA, Ford, 99. (14) Brandon Schilling, Sierra Vista, Ariz., Ford, 98. (16) Kody Vanderwal, LaSalle, Colo, Ford, 98. (18) Bill Kann, Scottsdale, Ariz., Toyota, 97. (17) Jesse Iwuji, Carrolton, Texas, Chevrolet, 97. (19) Takuma Koga, Nagoya, Japan, Chevrolet, 95. (20) Dan Phillippi, Los Angeles, Calif., Ford, 94.